Tony is a 14-year old Siberian/Bengal tiger used as a roadside attraction at Tiger Truck Stop in Grosse Tete Louisiana. Tony is an example of the serious problem of privately owned tigers in the United States whose numbers exceed tigers left in the wild. Tony’s owner, Michael Sandlin, has bought, sold, bred, and exhibited tigers for over 20 years. In 2003, because of violations and fines, Mr. Sandlin and the USDA made an agreement where 3 of the 4 tigers he owned, Toby, Khan and Rainbow, were sent to Tiger Haven in Kingston TN. The USDA reduced the fines and allowed Mr. Sandlin to keep one tiger, Tony. The Louisiana legislature passed Act 715 in 2006 which prohibits the ownership and sale of large exotic cats, including tigers in Louisiana. Those individuals who legally owned big cats as of August 15, 2006 were grandfathered in under this act. These owners would need to apply for an annual permit from the Louisiana Department of Wildlife and Fisheries and adhere to additional restrictions and stipulations. On July 20, 2007 The Louisiana Dept. of Wildlife and Fisheries wrote to Michael Sandlin informing him of the new state rules. He was given an application to fill out and submit and was told Tony would be grandfathered in if the permit was issued. The Louisiana Department of Wildlife and Fisheries wrote Michael Sandlin on October 22, 2008 advising him that his application had been placed on hold based upon their discovery of the 1993 Iberville ban. Part of their new rules (LAC 76: V. 115. H.13) require that the facility be in compliance with all local ordinances. It was discovered that the 1993 Iberville Parish ordinance prohibited ownership and display of exotic animals such as tigers, but the ordinance was never enforced. Because he was not in compliance with the 1993 Iberville ordinance ban on displaying wild animals, Mr. Sandlin was issued a citation form the LDW&F on November 17, 2008 and given 30 days to find a home for Tony outside the state of Louisiana. Mr. Sandlin was given until December 16, 2008 to relocate Tony. Big Cat Rescue, a non-profit educational accredited big cat sanctuary in Tampa Florida wrote to Mr. Sandlin on November 22, 2008 and offered to take Tony and provide a permanent home for him at no cost to Mr. Sandlin. Big Cat Rescue’s offer went unanswered and they contacted Maria Davidson, Large Carnivore Project Manager at the LDW&F and offered their assistance to seize Tony. Mr. Sandlin filed a petition for a temporary restraining order on December 15, 2008 against the LDW&F to stop them from seizing Tony. Judge J. Robin Free signed the order on December 16, 2008. The issue of what to do with the tiger was not on the council’s agenda, but members agreed to let one representative from each delegation have three minutes to state their cases. The council voted 11-1 to allow Tiger Truck Stop owner Michael Sandlin, to keep Tony — a decision that directly opposes parish ordinances restricting private ownership of exotic and dangerous animals. The Iberville Parish Council voted Tuesday (March 17) to allow Tony the Tiger to stay at the Tiger Truck Stop in Grosse Tete, but only if an upgrade of his habitat will be made. Contrary to this statement, on December 14, 2009, the LDW&F granted the permit to Mr. Sandlin which allows him to keep Tony on display 24 hours a day, 7 days a week at the truck stop. In 2010, major organizations supported Tony: a WSPA sponsored petition gathered over 40,000 signatures; on November 22, 2010 , The Animal Legal Defense Fund petitioned the Louisiana Department of Wildlife and Fisheries objecting to the permit renewal. Included in the petition were expert statements testifying to the detrimental effects physically and mentally to Tony by keeping him at the truck stop. Legal issues, such as Tony being illegally owned per the 1993 Iberville Parish ordinance, were addressed as well. The World Wildlife’s Fund’s report Tigers Among US included Tony in their interactive map, change.org pushed Tony’s petition and also showcased his story and Big Cat Rescue of Tampa Florida persistently advocated for Tony and his relocation to an accredited big cat sanctuary. Carole Baskin, CEO & Founder of BCR, spoke on behalf of Tony on ”Issues With Jane Velez-Mitchell” and BCR has continually networked Tony’s story, produced videos of Tony, and issued an action alert for Tony’s supporters to sign which reached key decision makers regarding the permit renewal. BCR’s offer of a permanent home for Tony at their sanctuary was refused by Tony’s owner Michael Sandlin. Despite people worldwide objecting to the permit renewal and the support of the aforementioned organizations, The Louisiana Department of Wildlife and Fisheries renewed their permit on December 14, 2010, allowing Mr. Sandlin to keep and display Tony. July 2010 marked Tony’s tenth year of life as well as ten years at the truck stop. A captive tiger’s lifespan with the proper medical care, diet, habitat and enrichment is 15 to 20 years. Tony lives amid the noise and fumes of car and trucks continually, and his primary dwelling is a concrete and steel enclosure. He has no real opportunity to run, swim and receives little enrichment. His health, safety, welfare and quality of life are of great concern to many people all over the world. Accredited big cat sanctuaries stand ready to provide a permanent home for Tony. The Free Tony The Tiger Campaign is committed to relocating Tony to such a sanctuary so he may live the rest of his years in peace and with the care and respect this magnificent cat deserves. Update: February 19, 2013: Attorneys for ALDF were in court on the morning of February 19, 2013 in Baton Rouge to defend our most recent victory, in which a district court judge ordered the Department of Wildlife and Fisheries to revoke the permit that allows Michael Sandlin to hold Tony the Tiger in captivity. ALDF lawyers told the three-judge panel of the Court of Appeal that the Department should never have issued a captive wildlife permit to Michael Sandlin, the owner of the Tiger Truck Stop. The judges listened attentively to arguments from all sides, and are expected to issue their opinion in Spring of 2013. We will update our supporters as soon as we know their decision. Update: January 24, 2013: by Animal Legal Defense Fund: On Tuesday, February 19, 2013 the courts will hear ALDF’s oral arguments in the appeal to free Tony. UPDATE: December 5, 2011: Both Mr. Sandlin and The Louisiana Department of Wildlife and Fisheries have filed motions for a new trial. Sandlin’s motion basically re-argues everything Judge R. Michael Caldwell has already decided. UPDATE: On August 15, 2011 Lawyers for ALDF will be in court in Baton Rouge to defend against Michael Sandlin’s, attempt to get the case dismissed. The Court has also set a hearing date of September 15 for ALDF’s motion for a mandatory injunction, which seeks an immediate revocation of Sandlin’s permit to keep Tony. UPDATE: June 28 2011: A hearing is now scheduled for July 22. Please continue to support Tony by signing his petitions and voicing your concern for him. Petition links and information on actions you can take for Tony: Your Continued Support For Tony Is Needed!! Thank you. UPDATE: On December 14, 2010 The Louisiana Department of Wildlife and Fisheries renewed their permit to Tony’s owner, Michael Sandlin allowing him to keep and display Tony at the truck stop. 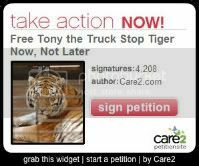 https://freetonythetiger.wordpress.com/2010/12/17/state-truck-stop-can-continue-live-tiger-exhibit/ The permit renewal by no means discourages us to continue advocating for Tony and for the home and life he deserves at an accredited big cat sanctuary. 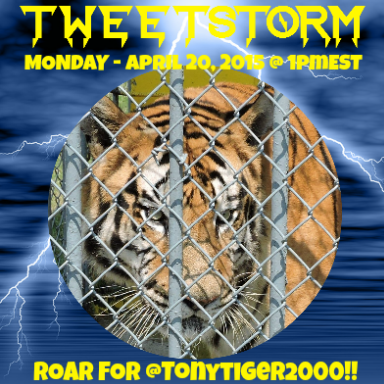 Please see this link: https://freetonythetiger.wordpress.com/take-action/ for an updated list of ways you can continue being a voice for Tony. Thanks to all of Tony’s friends for you support and dedication to him – don’t ever give up the fight for this handsome tiger’s freedom. My heart aches for Tony the sweet tiger who is imprisoned in a prison-like cage at a Conoco truck stop. He endures endless noise, breathes in noxious fumes from nearby traffic and from the gas station itself, he paces in pain in a cage largely of concrete where he is forced to walk and rest. He is taunted by curious onlookers and the ignorant ones who will throw rocks and objects at him just to see what he will do. His eyes look so empty and so sad. This is not a life for any tiger–or for any living being. He feels love, joy, pain, hunger, fear, and security just like people do but unfortunately, he has been robbed of all these positive feelings. Legislation needs to be changed so that Big Cat Rescue can provide a loving, nurturing environment so that this beautiful, majestic tiger can live out his remaining years in dignity and “tiger joy”. A healthy tiger can live well beyond 20 years. Tony is now at least 11 years old–how many more years will he have to endure this hell before his precious life is cut short??? I urge Louisiana to change the laws as necessary so that Tony and all other tigers and large cats can live as tigers should–even if it is in a safe sanctuary. At least it isn’t s small prison-like, fume-filled cage where he can’t even so much as get any exercise for his body. I feel horrible for Tony,being caged up all the time with the truck fumes and people always snapping pictures. Its no life for him,he deserves better! Keep up the fight! Tony deserves a better home and a happier future! Is there a petition on-line that can be signed and shared via Facebook or Twitter? 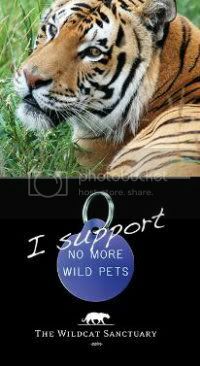 Please also see: https://freetonythetiger.wordpress.com/take-action/ for ways you can continue to advocate on Tony’s behalf. That is brutal. I’m shocked. Keep up the fight. You’re doing important work. Greetings from Finland. Tony the Tiger should be in the wild, and the people that keep giving the Truck Stop Owner permission to keep him in a cage also belong in a cage with the owner. Human beings think they can do whatever they want to animals because they think they do not have feelings. They have just as much as we do. Sometimes I think us humans don’t have any feelings at all, actually. Let Tony live out his days in peace. WHAT IS WRONG WITH THE WORLD! There was the 100 sled dogs slaughtered for no good reason at all and there was that dog Alice that was put in a cage by her owner for 6 years. WHAT THE HELL! People are so cruel! why are people allowed to get away with this, this tiger is meant to be in the wild not locked up in a cage. People who do stuff like this to animals make me sick !!! Let’s free Tony! If we don’t give up, continue to speak for Tony, he will will be free! We have Ian Somerhalder and Leonardo Dicaprio fighting for him, too…. Why has the law been broken time and time again for Michael Sandlin? Why is nobody doing their job? Meanwhile an innocent animal is rotting away in that cage. How can Tony be free? What do we have to do? There are many sanctuaries in the World that will keep & look after him? Why is such a difficult decision to make when it comes to protecting animals that man has made almost exstinct for his own greed or pleasure? Allow Tony a quality of Life & meet others of his kind to mate & help the deminishing blood lines to grow. Act in faith of saving this magnificent animal & allow it FREEDOM. there is no justice for this Tiger. Just because somebody can have a Tiger that doesn’t mean people should own a Tiger and have it in poor conditions. Where is the empathy? Who can speak for the Tiger in this case? Where are the authorities? Do they feel ok just because they are following the law, no matter how bad the Tiger’s life is? We are going to be judge on how well be treated lesser forms of life in this planet. If I was God I will use that as my measure on who deserves a better life when they are dead. I wouldn’t want somebody in paradise that didn’t care about animals. Tony must be free, and not inside a cage for all his life!!! Please leave free in a sanctuary, with other beautiful and healthy wild big cats. As great people once spoke, and as the ones who do now.. you want to save or beautiful Tony along with all the other animals in danger because of others selfish acts, who put money over life itself…. plus its just so obviously wrong where tony is at. i cant understand why a permit or anything would be renewed. besides greed and selfishness. Tony needs to go somewhere peaceful and safe, somewhere he can live out the rest of his life surrounded by love. Let Tony go. Have love in your heart. That is terrible! We’ve heard of truck stops in the 60’s and 70’s that owned lions or tigers to attract attention. We never knew that this type of thing is still happening in 2011! Ridiculous! We will go to Tony’s website. Murderers get a shorter sentence behind bars! Save Tony. He doesn’t belong there, he deserves a home in a sanctuary. I hope others learn of this and stop renewing such permits. The LSU Alumni Association was able to raise enough money to build Mike the Tiger a gorgeous new habitat in response to public outcry. I can’t believe the citizens of Louisiana are allowing this to continue in Gross Tete. Unbelievable! How do they let this abuse continue? It would be far from an exaggeration or misleading to say that Tony’s life has been robbed from him by one man….This Beautiful Endangered Tiger being held in captivity since he was born. Never had the chance or the privilege to know what life would have been like in the wild. Never had the chance to smell that sweet smell of ‘Life’. All because of one man’s greed and lack of respect for creatures like yourself. Those who truly love you Tony, those who truly believe that your right on this planet belongs to you, and you alone, are Fighting hard for you Handsome Boy. We won’t give up until you get YOUR LIFE back. We won’t give up until you get that chance to experience that Life that was Robbed from you. I, over and over have visioned have dreamed of you one day soon, stepping unto your new Living Space in a Big Cat Sanctuary..I have visioned you lifting your head and taking in all the wonderful smells of your fellow brothers and sisters that will be near you.I have visioned you experiencing what a real pool of fresh clean water will feel for you on those hot summer days. I have visioned you rolling around in the grass and lying there in total silence…no trucks, no highways..just the sounds of nature. Oh Tony…..you have had such a lonely terrible life dear boy. I try to imagine what it has been like for you for the last 10 years and I cannot. My heart aches for you sweetheart. Your life was taken from you by this terrible man, since you were a baby. A beautiful Tiger like yourself, never given the chance or the privilege to know what your life would have been like, in the wild…Free. My wish, my dream, my hope, my goal and my FIGHT for you handsome boy is that you day will come soon, so you can live the rest of your life at a Big Cat Sanctuary. So that for the rest of your life, you won’t be alone,you will smell the sweet smell of Life as it should be for you, and as it should have been for you for those 10 years of Prison you were forced to live. I will never stop fighting for you, or spreading the word about you Sweet Boy. This is ridiculous. I always thought that people were stupid but now its just been proven. Get that TIGER out of there and some where he can have a life. 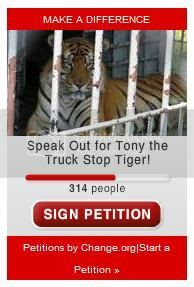 Please get Tony The Tiger out of this truck stop and into a sanctuary he needs to be amount grass and trees and water. he needs to be able to run and play and live out his life as it is suppose to be. I am so disgusted with this story and it breaks my heart that louisanna would allow this man to keep this tiger their. Maybe Mr Sandlin needs to be locked up in a cage for awhile to see how it feels. Please give that tiger to a place that will care for it as it should be, it is not fair to the animal and you are breaking the law as well. Please let this wonderful animal live in a sanctuary. If the owner loves this animal he would want him to be in a place where he is happy. The constant nightmare that he now calls home should be in turn reversed on the owner. Let him live in these conditions for a week, see he likes it. I get so tired of seeing animals being exploited for greed.